Core-Engine creates an API which we need to load processes and execute them. This API allows us to first create a Knowledge Base which include all our process definition that needs to be executed by the Session. This session has a reference to the Knowledge Base. 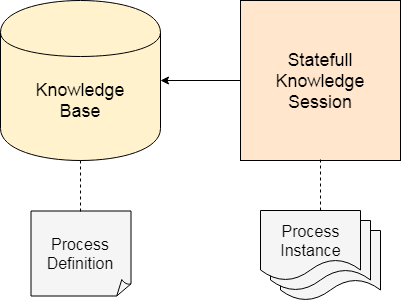 A Knowledge Base is a repository of all the relevant process definitions. It contains rules, processes, functions and type models. It always helps us to look up the processes definition whenever necessary. A Knowledge Base can be created only once and it can be changed dynamically. A Knowledge Base contains a reference to the session. Whenever we want to start a process, we need to set up a session which is responsible for communication with the process engine. After setting up the session we are able to start the execution of our processes. Whenever a process starts executing, it creates an instance of that process and maintains the state of that process instance. A session can be created many times.